Rough around the edges, sure, but Black Cat: Bohemia has heart and soul enough to win the day. Perhaps it’s the early evening start time, or the underwhelming lighting, or the unnecessary opening monologue – but the opening ten or fifteen minutes of Black Cat Cabaret’s latest show just feels awkward. Far from a night of bohemian, raucous revelry, there’s a danger of wondering where else one might have been instead, or thinking ahead to a post-show cocktail. Thankfully, the sheer power of charm, enthusiasm, and occasional acrobatic brilliance perform the oft-impossible feat of turning things around after an inauspicious start. Once compere Miss Frisky is mingling playfully with the audience, and eschewing spoken word for a few mesmerising songs, the packed spiegeltent noticeably relaxes. Miss Frisky’s consummate compering aside, the real heart of this show is the clowning of LJ Marles & Nicolas Jelmoni, whose appearances between set-piece acts – borrowing left-behind equipment to parody the performances that have just finished – often upstage the real thing! It’s fitting then that they bring the show to a triumphant close with their own set pieces: Jelmoni with a standing-o inducing display of strength, balance and agility alongside Charlotte O’Sullivan; and Marles wowing the audience with a powerful, athletic and jaw-dropping aerial tension straps routine. 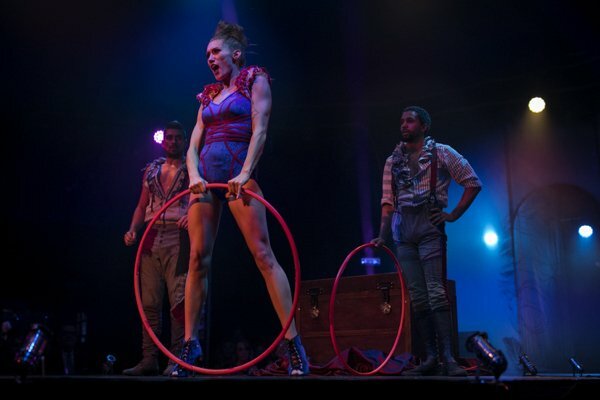 Some of the circus acts don’t quite hit the spot, and perhaps a livelier crowd (though they were won over in the end) would’ve made more of the likes of cyr wheel artiste Jo Moss, and aerialist Katharine Arnold. Half way through, our evening in Bohemia was struggling to break out of 2.5 star territory – but through sheer willpower, and drawing energy from an audience that seemed to get in the mood towards the end, Miss Frisky and co pulled it out of the bag!